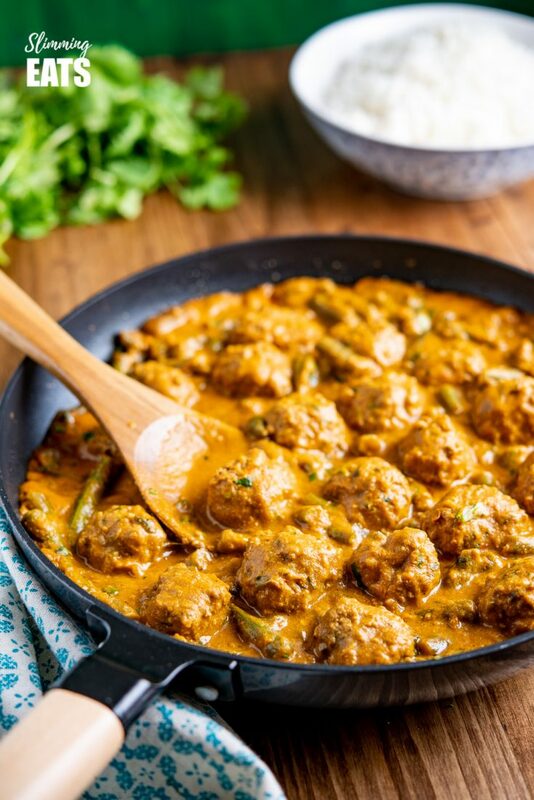 A Creamy Coconut Beef Meatball Curry – delicious tender meatballs with hidden veg in an amazing coconut sweet potato sauce. 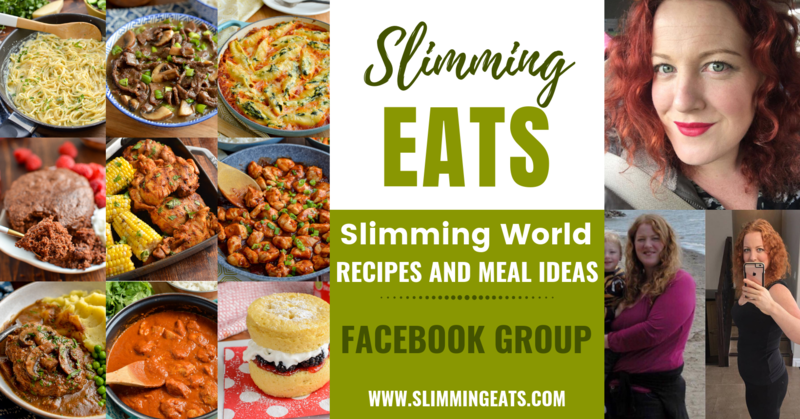 You know those days you have a pack of ground beef (beef mince) in the fridge and are not sure what to make? Bored of the usual chilli, spaghetti bolognese or cottage pie etc. Well, it was one of those days. I had taken some mince out of the freezer with the intention of making chilli, but when it came to it, I didn’t actually fancy chilli at all, so raided my pantry and fridge looking for inspiration for what I could add to it for a meal for dinner. 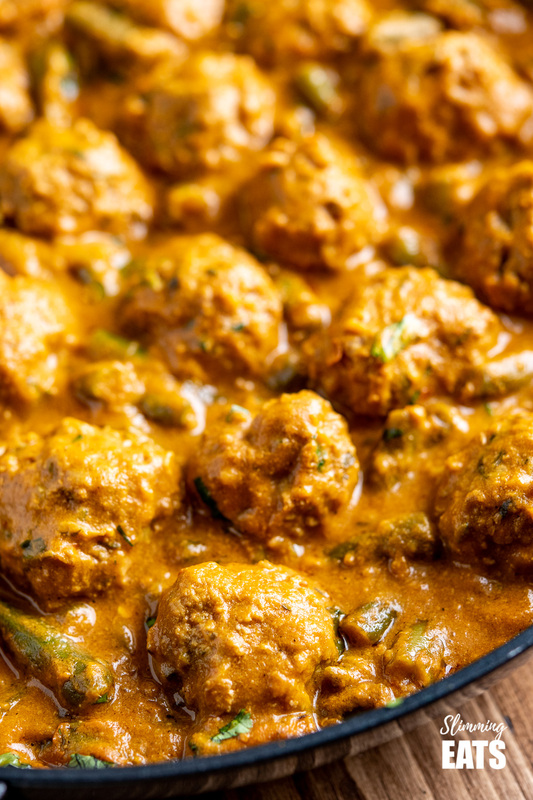 That was when the tin of coconut milk caught my eye and grabbing a sweet potato, I figured a delicious Creamy Coconut Beef Meatball Curry would be perfect. 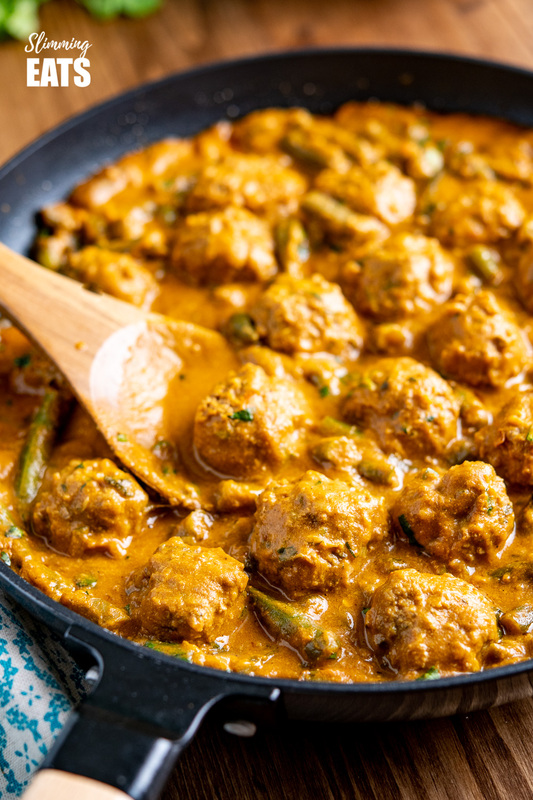 But You may be wondering, but what has a sweet potato got to do with a Coconut Beef Meatballs Curry? Aha well, that’s a clever ingredient I use for adding a lovely subtle sweetness to my curry along with the creamy coconut milk. It really helps to thicken the sauce and add a lovely silky feel. Like in this Coconut Chicken Sweet Potato Curry, which is one of our favourite curries. However, this curry may now go to the top of our list for favourite curries of all time. 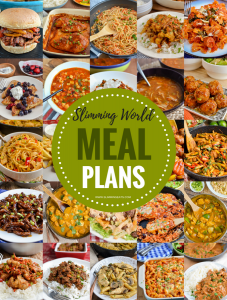 For the sweet potato mash used in this recipe, you can either cook a whole sweet potato in the microwave or you can steam in a saucepan and mash and then weigh the desired amount, Either is perfectly fine. This is a great recipe for the whole family too. Adding some finely grated zucchini (courgette) into the meatball mix, really helped to keep those meatballs so lovely and tender and juicy and the kids didn’t even realise it was in there. Bonus!! 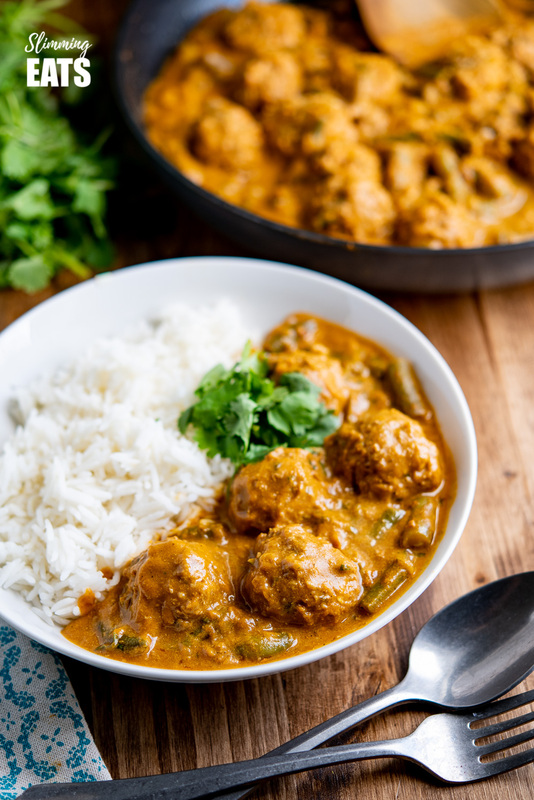 How can I add a 1/3 speed foods to this Coconut Beef Meatball Curry? 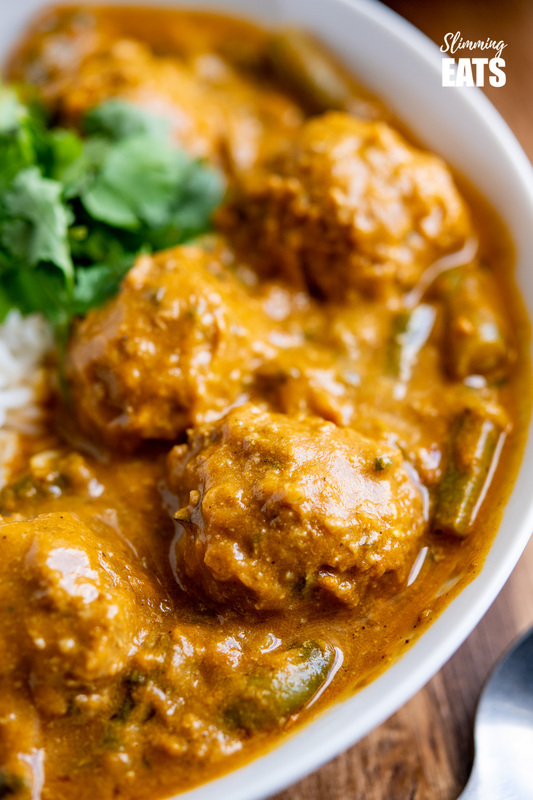 Firstly let’s cover the speed foods this delicious Coconut Beef Meatball Curry contains. There is grated zucchini hidden in the meatballs and then I also added in some chopped green beans for additional vegetables in the curry. Which packs this yummy recipe with lots of healthy vegetables. You could take the speed foods even further and serve this with my amazing Roasted Cauliflower Rice instead of regular rice. 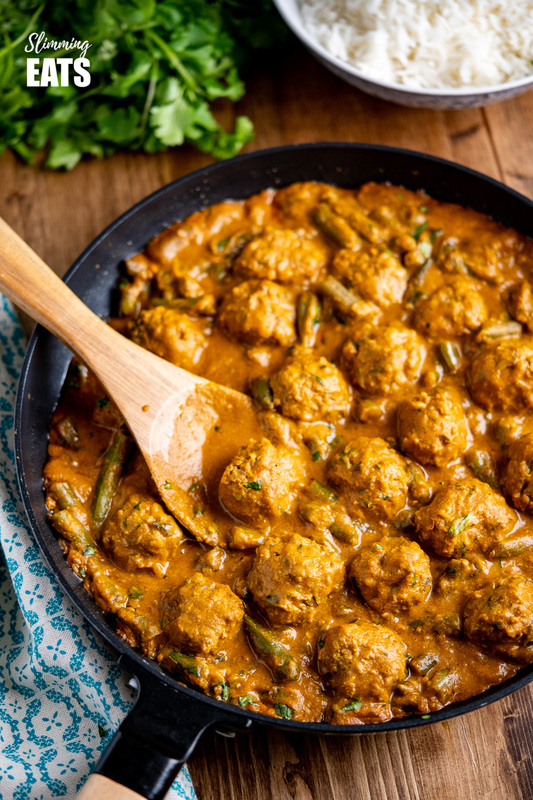 A Creamy Coconut Beef Meatball Curry - delicious tender meatballs with hidden veg in an amazing coconut sweet potato sauce. Add the ingredients for the meatballs to a large bowl and form into approx 20 meatballs and set aside. Add the sweet potato mash, curry powder, beef stock, red chilli flakes, and tomato paste to a deep frying pan over a medium heat and stir until it's all combine and becomes a smooth sauce. Drop the meatballs into the sauce (you don't need to brown them first), cover and simmer for 15 minutes. Stir in the coconut milk and green beans and continue to simmer without the lid for 5 minutes. If you prefer a more saucy curry, you can also add in a little more stock at this point. Serve, garnish with coriander (optional) and enjoy! !